The purpose of this effort is not clear. If the idea is to immobilize the water in the trenches in order to end radioactive leakage into the ocean, grouting the tunnels would be easier. If the issue is the contaminated water, a mobile version of the ALPS or similar on a barge in the harbor would be more direct. 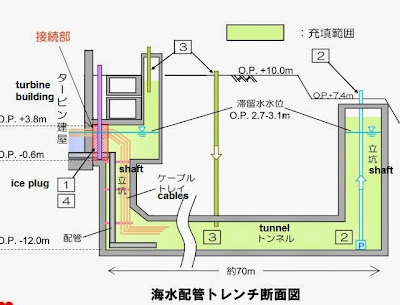 TEPCO could just recirculate the trench water though the filtering system if the concern is that pumping water out would simply produce more inflow int6o the trenches. 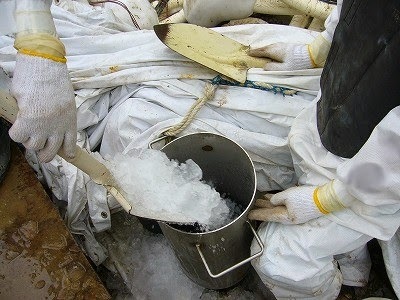 As is, freezing a large volume of water with dry ice seems amateurish, as it is difficult to pour thousands of tons of dry ice into a 30cm pipe. A cold loop with chilled ammonia or Freon would be much more practical, although the cooling medium may well get contaminated in the effort. Looks like the only thing that is getting frozen are the idiots holding the ice. This whole effort of bring everything to "cold shutdown" has proven that no such thing is possible....literally! Just as well, that trench water (probably some saltwater) is so radioactively hot that it can't be dealt with properly. Everything Daiichi comes in contact with becomes either radioactive or radioactively contaminated. At those levels of contamination, a filtering system wouldn't last more than a couple of month before having to be scrapped. There are no answers so far to contain the Daiichi's melts. It's unstoppable. Feed and bleed even if the feed or bleed is not controllable. "no discernible effect of ice/dry ice on freezing the water"
I'm surprised no one's asked this question yet: Does the trench water freeze in lab experiments? How "hard" is the trench water? Does it have other unusual properties .. like not evaporating? what are they trying to do? a japanese crushed ice? How hard is the trench water ? I think the trench fries. The stopple method is used to insert a plugging into a pipe which is temporarily block sections of live pipelines. This method is used for a number of reasons like the affected section of a pipeline could be tapped, plugged and safety isolated without shutting down.